A hell of a haul from LightHouse Wines in Whiteabbey (see pic below) will help make a real dent in the list. Reviews will probably come in the next few posts rather than this one, but go get 'em while they're fresh! Description: Copper colour. Clear but no head. Lots of ginger and spice aromas. Again ginger flavours, sweet, a little bit spicy, with some toffee malts in the background. Light mouth feel. Thoughts: A bitter with added ginger. Not a huge fan of ginger beer generally – this isn't something I would have bought if it wasn't on the list - and this beer doesn't do anything to change my opinion. Too much ginger, too light bodied. Not the worst but not something I would try again. 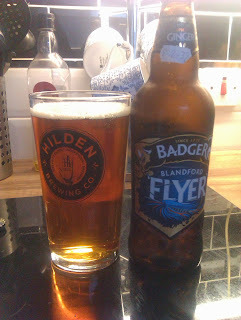 (Note – name change from the book, this used to be called Blandford Fly but it's the same beer). Description: Amber, clear, and a good head. Big aroma of tropical hops. Hop bomb on the first taste, settled down a bit after. Lots of pine. Slightly astringent. Light and fizzy mouth feel. 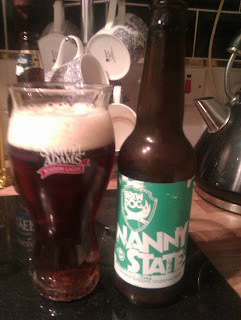 Thoughts: You can read the background to the development of Nanny State here. A bit of a fun “up yours” to regulations and regulators then. It's actually not bad, though the low ABV means it lacks a bit of something for me, especially in mouth feel – it's almost watery. Having said that, for a low alcohol beer it packs a real flavour punch! Description: Man this is dark, jet back in appearance with a decent dark brown head. Lots of coffee, chocolate and roasted (almost burnt) malt aromas. Big flavour hit of coffee, cocoa powder, dark chocolate, woody, smoky and booze. Syrupy, sweet, and boozy mouth feel. Thoughts: There's a lot going on with this beer, but it's all good. 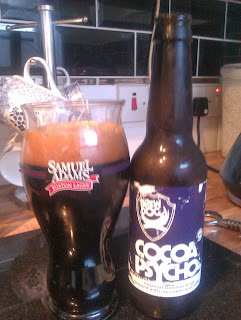 Not up there with the Kernel stout I had recently, but pretty damn good. Just a note, you'd know this was 10% but not in a bad way.